How Much Value Can an Extra Bath and Bedroom Add to My Home? Home renovations can be expensive and picking the right home improvement project is crucial in order to achieve the maximum added value for your property. Some additions give you a higher return on investment, or ROI, than others when you sell your home. In most cases, an extra bath and bedroom will add substantial value to your home, with an estimated ROI of 66 to 90 percent. In a strong housing market, the addition of an extra bath and bedroom can add substantially to the resale value of your home. In a sluggish market, home improvements may not pay for themselves, depending on how long you plan to stay in your home. 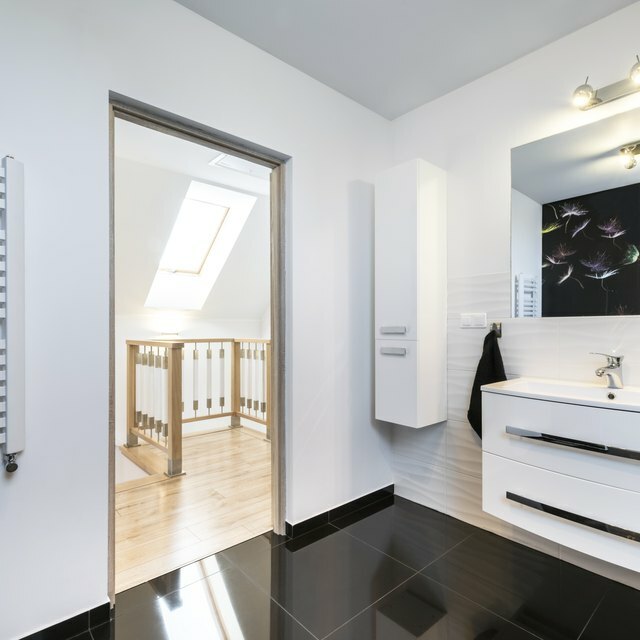 For 2013, the national average cost in the United States for a bathroom addition was $37,501, and such a project resulted in an increase in resale value of $20,569. The average cost for a bedroom addition, that is, an attic bedroom or master suite addition, was $47,919 with increased resale value of $34,916. Consider the other houses in your neighborhood before deciding how much value an extra bath and bedroom could add to your home. Overbuilding for the neighborhood could be an expensive venture that is not likely to pay off in the end. On the other hand, if your home has two bedrooms and one bath, and many houses in the area are three-bedroom, two-bath homes, adding an extra bath and bedroom could significantly increase your home’s value. If you plan to sell your home in the near future, you may want to consider smaller, less expensive home improvements because there is no guarantee that you'll achieve a worthwhile return on your investment. Spending $40,000 to add an extra bath or convert attic space into a bedroom does not mean you will get $40,000 back when you sell the house. If your house is already comparable to other properties in your neighborhood, a modest makeover of the entire home could save you money and pay off better than a bigger-budget project on one or two rooms. Especially if you plan to move in the next year or two, save the money to put into your new home, and complete a few less-expensive enhancements instead. Home staging experts recommend spending a more modest amount -- $5,000 to $10,000 -- for fresh paint, new carpet, updated fixtures, doors and windows, curb appeal and other general improvements that attract buyers. When you consider to what extent you want to go with your home improvement project, it is best to follow the 15 percent rule. Know your home’s value, and do not spend more than 15 percent of that on any one project. Some beneficial projects with the best ROI include: interior/exterior paint, which returns 75 to 90 percent of the amount you put in; adding an extra bath and bedroom, which adds 66 to 90 percent ROI; kitchen remodeling at 72 to 80 percent ROI; and adding a deck, which gives a 71 to 81 percent ROI.